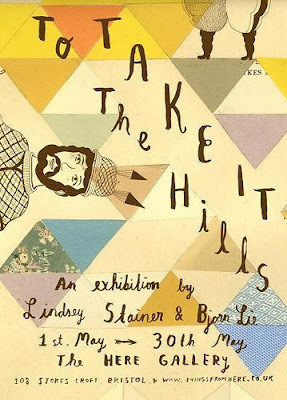 Take it to the Hills is an exhibition of new drawings, collages, prints and paintings by Bristol based artists Lindsey Stainer and Bjorn Rune Lie. Drawing inspiration from old National Geographics, 60’s handicraft books and patchwork quilts, Lindsey’s playful and evocative collages have a timeworn quality. She works with salvaged paper and paint to create graphic works which celebrate the humdrum and commemorate the lives of everyday strangers. Letting his acrylics rest in their tubes, the normally colourful Bjorn is using this exhibition as a chance to focus his efforts on pure drawing, working in pen and ink, pencil and charcoal. Despite the monochrome hues, his exquisite pictures of curious characters, mysterious trees and strange situations are as vibrant as ever. There is beauty in a black and white rainbow! Bjorn Rune Lie is a Bristol based Illustrator and Printmaker. Growing up on a beautiful mountainside in Drammen, Norway Bjorn spent his childhood building tree houses, listening to heavy metal and drawing comics. He graduated from Falmouth College of Arts in 2001 and has been working in his dream job as a freelance Illustrator ever since. Bjorn’s drawings, paintings and prints are inhabited by a cast of bizarre and outlandish characters of extreme proportions. Bjorn’s work can be found on milk cartons, tee-shirts, book jackets, album covers and church fans across the globe. He has also written and illustrated two Norwegian children’s books. 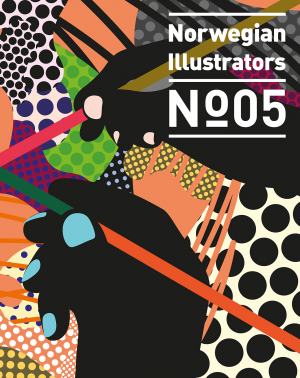 Lindsey Stainer studied illustration at Edinburgh College of Art, graduating in 2001. She then moved to Norway and spent three years skiing amongst pine trees, knitting very long scarves and learning to bake the perfect blueberry pie. Lindsey moved to Bristol in 2004, became a member of Jamaica Street studios and has since been assembling her intricate and peculiar collages with a steady hand. Scouring car boot sales up and down the land, Lindsey searches for inspiration in the things other people throw away. This is her third exhibition.